Professor Jeffrey Sachs, director of the Center for Sustainable Development at Columbia University, thought he was supporting the Green New Deal with his February 22nd editorial published on CNN.com. But he may have also exposed the Green New Deal’s greatest deception: the belief among its advocates — New York Rep. Alexandria Ocasio-Cortez being the most prominent — that addressing climate change will require significant federal budget line item expenditures. Decarbonizing the U.S. economy is this generation’s ‘moon shot’, says Ocasio-Cortez. But what exactly will the federal government spend money on to decarbonize the country? Our decarbonization efforts so far have not relied heavily on government programs. Why should this be different in the future? In an essay designed to remove the myths surrounding the Green New Deal’s likely budgetary requirements, Sachs proceeds to answer that question…and the answer may or may not be what climate activists want to hear. The significance of Sachs’ last sentence cannot be exaggerated. Regulations, building codes, resource planning, and market forces are transforming the U.S. from a carbon-based to a clean energy-based economy. And this conversion is moving extraordinarily fast without any significant federal programs or massive investments up to now. Furthermore, as per kilowatt costs for renewable energy continue to decline, this conversion will accelerate as old coal plants are shut down and renewable generation plants are put online. There is no future for coal in the electricity business, and the prospects for gasoline-powered combustion engines aren’t any brighter, according to Bloomberg NEF, a leading provider of primary research on clean energy. Bloomberg NEF forecasts that, by 2040, 55 percent of all new car sales worldwide and 33 percent of the global fleet will be electric vehicles (EVs). Pushing the momentum in favor of EVs is the fact that “the upfront cost of EVs will become competitive on an unsubsidized basis starting in 2024; by 2029, almost all segments reach parity as battery prices continue to fall,” according to Bloomberg NEF. The bulk of this progress on clean energy did not require trillions of dollars in federal outlays. To the contrary, Barack Obama’s administration failed to pass any carbon tax legislation and was forced to rely on the executive branch’s regulatory and rule-making authorities in order to achieve its green energy goals. In ending coal’s long term relevance, the Obama administration was surprisingly successful in addressing climate change considering it had little support from the legislative branch. Even with the Trump administration’s pro-coal stance, which has led to the relaxing of Obama-era environmental regulations and has encouraged more domestic oil and natural gas production, there is no concerted effort to build new coal plants. While climate change activists are dismayed at the significant increase in U.S. oil and natural gas production in the past 10 years, powering this surge has been a realization within the oil industry that the days of oil and gas will end someday. Extract the oil and gas now while there is still a market for it. British Petroleum’s chief economist, Spencer Dale, admitted last year that the “speed of the transition underway” now in the energy industry has been a surprise. In particular, India and China have developed solar power at much faster pace than BP expected. The green energy revolution is unstoppable according to many energy analysts and forecasters. “The evidence certainly suggests that renewables have won and a low-carbon future is all but inevitable,” says Kevin Haley of the Renewable Energy Buyers Alliance. So why the panic by Ocasio-Cortez and other climate change activists? First, the Trump administration’s hostility towards addressing climate change has spurred activists into action to a degree a sympathetic administration might not have inspired. Add to that when the Intergovernmental Panel on Climate Change’s warned that the planet had until 2030 to transition to clean energy to avoid global warming’s worst consequences, the activist community found the perfect storm for generating a massive call to action. Second, and more importantly, climate change is a highly partisan issue where the Democrats have a clear majority on their side (see Figure 1). The political center is with the Democrats. According to the American National Election Study (December 2018), 85 percent of Democrats believe the federal government should be doing more on climate change. This represents 39 percent of the total voter eligible population (VEP). But even among ‘independents’ — that do not lean ‘Democrat’ or ‘Republican’ — 54 percent want the government to do more on climate change. That’s another 9 percent of the VEP, combined with Democrats, the percent of the population open to more government action on climate change comes in at 55 percent. If climate change is an important issue to voters when they enter the voting booth in 2020, the Democrats will be in great shape. When Ocasio-Cortez compared the Green New Deal to the U.S. moon program of the 1960s, it was a tremendous disservice to the climate change movement as it leaves the public with a flawed understanding of what will be involved in fighting climate change. The moon landing required a government-centric approach as there was no commercial, private sector motive to go there. Combating climate change, in contrast, will be led by the private sector given phenomenon’s potentially radical impact on the world economy. That is the basic implication of Sachs’ article. 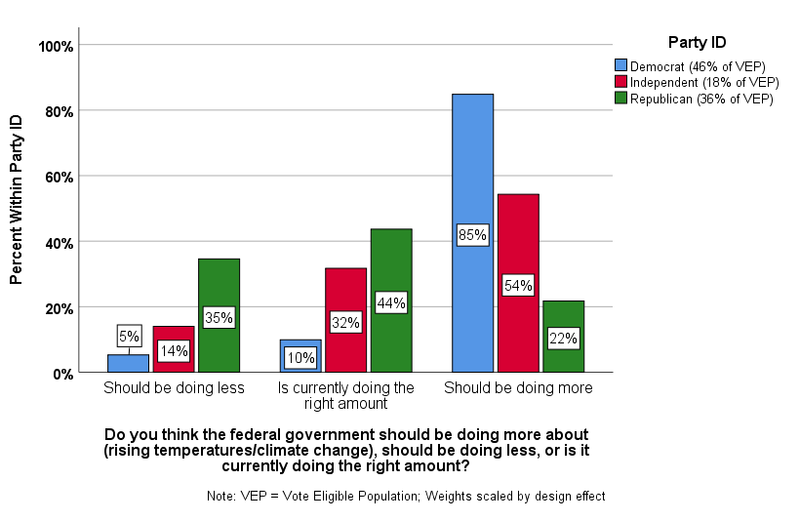 While not zero, the federal government’s role is going to be comparatively small. Mandates to install heat pumps into new buildings and retro-fitting them into existing buildings is a cost borne largely by the private sector. Ditto for the shuttering of coal plants and replacing them with renewable and clean energy alternatives. Market forces offer the incentives to retool auto plants to manufacture EVs and to build out a national charging station infrastructure that will phase out gasoline combustion engines by around 2050. If we believe the forecasts being generated by Wall Street and automotive industry analysts, it is in the short-term where the government can be most impactful. But that is a transitory federal budget line item. Other areas where the federal budget will be impacted is in disaster management, research funding, and the updating of the nation’s power grid infrastructure. And even those expenses can be defrayed through a modest carbon tax, if such a tax could ever be passed in today’s political environment. On that suggestion, I offer an apology to Modern Monetary Theory (MMT) devotees for my thinking new spending must have an equivalent funding mechanism. Old habits die hard. But even if MMT becomes the accepted economic paradigm and we stop judging government spending by its impact on the deficit, the theory is still not a license to piss federal budget money down a rabbit hole. The argument for government spending must always be rooted in its social and economic sense, and so it will be for addressing climate change. Economists and investors generally agree that countries that are the ‘first movers’ on climate change will benefit the most economically in the long-term. Such is mainstream investor thinking on how companies and governments should address climate change, which is in contrast to Ocasio-Cortez’ “maybe we should rethink having children” musings on the topic. Chicken Little-caliber analyses of the risks associated with climate change are counterproductive. As long as the private sector continues to do what is has been doing on greenhouse gas mitigation and the government remains supportive, the sky won’t be falling. Rather, opportunity will be rising. That is the tenor of Sachs’ CNN article — even if he wouldn’t quite summarize it that way. Therefore, the best thing the federal government can do to address climate change is to continue to let market forces lead the transformation to a clean energy economy and to offer assistance when gaps need to be filled.